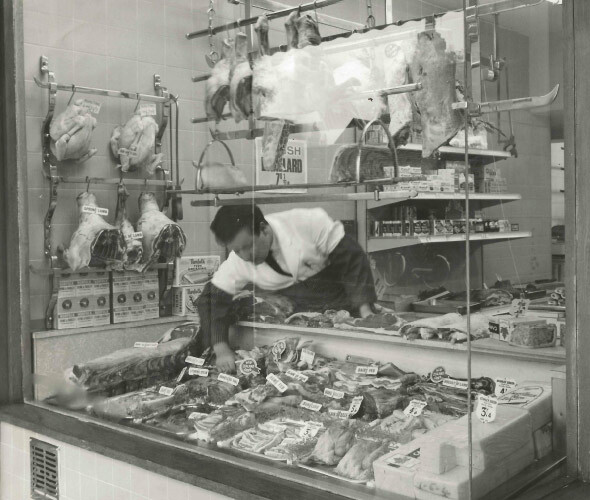 During the 1950’s, on the site of the present-supermarket in Pangbourne’s Square, there was a high quality butchers called Colebrooks. It was owned by the Reading firm of the same name, and the manager was Stanley Green. He took on a keen young apprentice by the name of Royston Hine. Colebrooks was sold around 1962, at a time when the MacLachlan Family Company was redeveloping the old furniture shop and Constitutional Club at 2/10 Whitchurch Road. Group Captain MacLachlan invited Stanley Green to set up a quality butcher to replace Colebrooks, and Stanley asked Royston to be Manager. The new shop was an immediate success. Both owner and manager were dedicated in their pursuit of excellence. But by 1967 young Royston determined to see more of the world and spent the next twenty years developing a successful career in the meat trade, culminating in a senior international corporate directorship. In 1988 Stanley retired. Royston, by then keen to withdraw from the rat race, bought the business. As the shop had become well known as Green’s, the name was retained. Royston’s son-in law Philip Cripps joined in 1990 after 11 years as a Chef, mainly with TrustHouse Forte but including training with Paul Bocuse in Lyon, France. The combination of Master Butcher and Master Chef has made the business one of the finest of its kind in the country. Philip’s wife Caroline (nee Hine) is active in the business as is Royston’s brother Robert. Susan, Royston’s sister has recently retired as cashier due to ill health. Royston’s grandsons Christopher – already a champion sausage maker – and Michael have also joined the team. Laura, Royston’s granddaughter is the latest family member to join with a part-time admin role whilst continuing her studies. All staff are encouraged to feel part of the Green’s family. Green’s meat and poultry comes from farms well known to us, often for decades. The farms adhere to strict codes of feed, husbandry, and animal welfare. Some have subscribed to the Soil Association. In short, using Green’s, with an established professional record and reputation, ensures that you receive safe, high quality, and tasty meat. The same superior meat is used in our pies, sausages and other products. That’s why the taste, texture, and nutritional; value are invariably so much higher than mass-produced alternatives. And for those concerned to cut down on their sodium intake – since 2009 we have used lo-salt instead of regular salt. Private, compact, modern. Fully approved to EU standards with full meat inspection and veterinary personnel. Farms are carefully monitored by Green’s and abattoir management. Green’s are licensed by and independently inspected by West Berkshire Council and have been awarder the highest possible 5-star excellent hygiene rating.